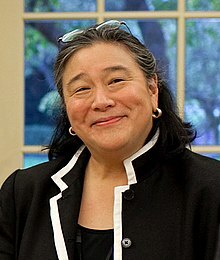 Christina M. "Tina" Tchen (simplified Chinese: 陈远美; traditional Chinese: 陳遠美, pinyin: Chén Yuǎnměi) (born January 25, 1956) is an American lawyer. From 2011 until 2017, she served as Assistant to President Barack Obama; Chief of Staff to First Lady Michelle Obama; and Executive Director of the White House Council on Women and Girls. From the date of Obama's inauguration until January 5, 2011, she was the Director of the White House Office of Public Engagement, previously known as the Office of Public Liaison. Tchen was born in the U.S. to Chinese immigrants who fled the People's Republic of China in 1949. Her father worked as a psychiatrist and her mother as a scientist. She grew up in Beachwood, Ohio where she graduated from Beachwood High School. She has known Amy Rule, Rahm Emanuel's wife, since they were teenagers together in suburban Cleveland. She graduated from Radcliffe College of Harvard University in 1978, and received her law degree in 1984 from Northwestern University School of Law. After graduation from Radcliffe, Tchen worked for several years for the Illinois Bureau of the Budget where she served as the Governor's budget analyst for the Department of Children and Family Services. She then went to law school, and after graduation went to work as an associate attorney for the Chicago office of the law firm Skadden, Arps, Slate, Meagher & Flom. Tchen worked at Skadden for 25 years where she specialized in litigation at all levels of the state and federal courts. She represented companies, officers and directors in shareholder class and derivative actions. She also handled a wide range of commercial, intellectual property, and employment-related litigation, and represented public agencies in state and federal class actions, including the Illinois Department of Children and Family Services, the Illinois Department of Public Aid and the Chicago Housing Authority. She was a partner at Skadden for 13 years before her appointment to the Obama administration. In March 2019, Tina Tchen was hired to investigate the Southern Poverty Law Center's "workplace culture" after allegations of sexual and racial harassment led to the firing of the SPLC's co-founder and resignation of its president. Tchen has served on several boards for organizations involved in public, legal and social policy: the Chicago Bar Association Foundation; the Field Foundation of Illinois (chair of the board); the Chicago Public Library (trustee); and the Chinese American Service League (board member). Tchen has served on the Judicial Nominations Commission for the Northern District of Illinois and has served in several leadership positions with the American Bar Association Litigation Section. Tchen is the recipient of a number of awards recognizing her contributions in the legal field: Leadership Award from the Women's Bar Association of Illinois (1999); "Women of Achievement" award from the Anti-Defamation League (1996); and Chicago Lawyer (Magazine) "Person of the Year" (1994). She was selected for inclusion in Chambers USA guide to America’s Leading Lawyers for Business (2008) and The Best Lawyers in America (2009). She also was selected in 2007 as one of the top three women business lawyers in Illinois by the Leading Lawyers Network. In 2011, she was honored with the Harvard College Women's Leadership Professional Achievement Award. ^ a b Skiba, Katherine (2011-01-06). "Michelle Obama's new chief of staff 'energetic' and 'driven'". Chicago, IL: Chicago Tribune. Retrieved 2011-09-15. ^ "Tina Tchen to become Michelle Obama's Chief of Staff". Washington, DC: Asian American Action Fund. 2011-01-05. Retrieved 2011-01-05. ^ a b "Tina Tchen to Join Office of the First Lady as Chief of Staff". Washington, DC: The White House Office of the First Lady. 2011-01-05. Retrieved 2011-01-05. ^ "Council on Women and Girls: Leadership". Washington, DC: The White House Council on Women and Girls. 2009-10-01. Archived from the original on 2011-10-01. Retrieved 2011-09-15. ^ "Engagement, Women, Health Care, and Yarn". Washington, DC: The White House Office of Public Engagement. 2009-05-18. Retrieved 2011-09-15. ^ a b c Who Runs Gov. "Profiles: Christina M. Tchen" Archived 2009-08-20 at the Wayback Machine, WhoRunsGov.com, accessed August 2, 2009. ^ "Amy Rule: Chicago's reluctant first lady". Chicago Tribune. 2012-07-02. ^ "Christina M. Tchen". Washington Post. 2012-11-16. Retrieved 2018-11-13. ^ Burch, Audra D. S.; Blinder, Alan; Eligon, John (2019-03-25). "Roiled by Staff Uproar, Civil Rights Group Looks at Intolerance Within". The New York Times. ISSN 0362-4331. Retrieved 2019-03-27. ^ "CHRISTINA M. TCHEN". Washington, DC: The White House Office of Public Engagement. 2009-08-31. Archived from the original on 2011-09-04. Retrieved 2011-09-15. Wikimedia Commons has media related to Christina Tchen. "Christina Tchen". Chicago Chinese News. 2011-01-05. Retrieved 2011-01-05. Secretary of Transportation John King Jr.
† Remained from previous administration.